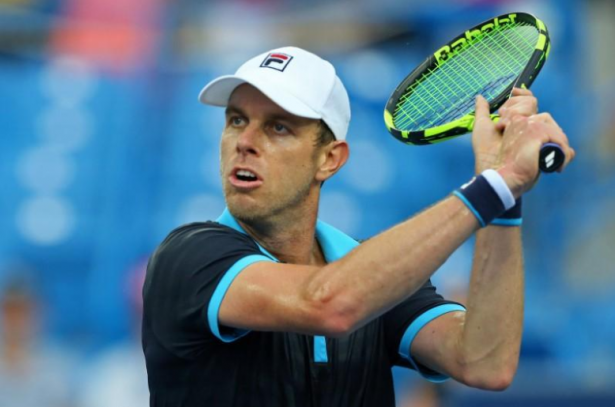 American 15th seed Sam Querrey cruised into the second round of the Cincinnati Open with a routine 6-3 6-0 win over compatriot Stefan Kozlov on Monday on a day when the old guard dominated the younger players. Wimbledon semi-finalist Querrey, 29, was barely tested by his 19-year-old wildcard opponent in the 51-minute match during which he dropped only four points on serve and did not even face one break point. "Went out there and just kind of put my head down and went to work, and played a really solid match from start to finish. It felt good," said Querrey, who since Wimbledon has won a tournament in Mexico and reached the Montreal third round. Querrey will next face the winner of Tuesday's clash between Dutchman Robin Haase and France's Adrian Mannarino. Ivo Karlovic, who at 38 is one of the oldest players on the ATP Tour, enjoyed a 6-3 3-6 7-5 win over Czech 24-year-old Jiri Vesely while Italy's Fabio Fognini, 30, held off Russian youngster Daniil Medvedev 7-6(5) 6-4. In keeping with the trend of veterans beating youngsters, Spain's Feliciano Lopez, 35, beat 21-year-old South Korean Chung Hyeon 7-6(5) 6-1. Unseeded Frenchman Richard Gasquet enjoyed a 6-4 6-4 win over John Patrick Smith of Australia to set up a second-round clash with Rafa Nadal, who is already assured of returning to world number one next week for the first time since 2014. Spain's Fernando Verdasco, 33, however, was not as fortunate as he dropped his first round encounter with slightly younger German Mischa Zverev 6-4 6-4.